Terror in Brazil exists. It is commonplace and real. In the enormous territory known for samba, cachaça, and football, an incredible variety of cultures coexists. Brazilians are said to be hard-working, happy people who have never “officially” suffered a terrorist attack in all of their history. But in Brazil, as in other Latin American countries, terror is organized by those from above, and manifests in those systematic acts planned from the desks of those who have power under the State, as well as from those in charge of the media. At the moment, the Brazilian congress is debating a counter-terrorism bill. It addresses the PLC 101/2015 bill created by the executive branch (President Dilma Rousseff of the Partido dos Trabalhadores (PT) or the Workers’ Party). After being passed in June by the Chamber of Deputies, it was recently modified by the Senate after an extensive debate. This is not the first attempt to create a law that specifies the crime of terrorism in Brazil and, as the text was modified, it will have to be debated again in the Chamber of Deputies. Among the modifications was the removal of a paragraph that attempted to defend and protect those participating in social movements, which would allow for new expressions of resistance. International pressure, mega events like the next Olympics and the last World Cup, and fears regarding rumors of the presence of members of the Islamic State (ISIS) in national territory are arguments widely cited by those who intend to justify this legislative reinforcement by the repressive structure of the state. It is intended to restore the foundational motto of the state: “Order and Progress.” More than anything, at this political stage, there is a principal motivation for the power that runs through the crisis provoked by the limits of neo-developmentalism: To persecute social movements. September 11, 2001, marked by the terrorist attacks on the Twin Towers in New York and the U.S Pentagon, is a day that profoundly changed history. For the U.S., it seemed a diffuse and elusive enemy (that was constructed and nourished by the same imperial power that gave the U.S. the opportunity to launch a new stage of international politics). In this context the “World’s Sheriff” announced the “War on Terror.” Counter-terrorist laws became an imperial requirement, and Bush’s message to the world was clear: “either you are with us or you are with the terrorists.” To improve effectiveness, the empire entrusted to the GAFI (the Financial Action Task Force), the international organism created in 1989 against the money-laundering from narco-trafficing, and that in 2001 changed its function. It is the organism in charge of pressuring and monitoring the creation and application of legislation in various countries. Although the discussion around the creation of a counter-terrorist law began 22 years ago in Brazil, the current context now presents a major opportunity than the last time that such a law was debated. Before the World Cup, during the mobilizations in 2013 from social movements, resistance to the law was much greater and the project was scrapped. In the last elections (October 2014), however, the most conservative congress in recent years was elected. In spite of the triumph of the coalition that heads the Workers Party, the plan of government implemented is from a neoliberal court, with proposed cutbacks in education, and healthcare, and with a growing loss of rights and jobs. The party that truly occupies power in this new stage is the PMDB, who has been present in the many Brazilian governments of the last decades. It is the executive (President Dilma) who will introduce the new counterterrorist bill in congress, and who recently traveled to the U.S. where she met with the unusually named Nobel Prize Winner, Obama. The war on terror needed a legislative structure much stronger in the biggest country of South America. 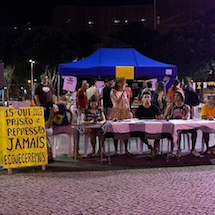 “Today, terrorism is the force of the state in the favelas in all of Brazil,” said a professor during an event on October 15 two years after female professors were brutally repressed in Cinelándia, the center of Rio de Janiero. These examples, like emblems, are multiple: the disappearance of Amarildo in la Rocinha, Rio de Janiero, the massacre of Osasco in Sao Paulo, or the death of the young boy Eduardo in the Alemao Complex (Rio de Janeiro). The list of those murdered by the state in the favelas is interminable, and reveals the record number of murders by the Brazilian police, [according to] Amnesty International that released a report this year. The international reign of capital does not respect the autonomy of the people. In the political game planted by this representative democracy, there is always a polarization between two positions. The counterterrorist law constitutes a legislative structure that guarantees the existing forces, crystallizing the enormous inequality in the use of force for the construction of hegemony. Progressive, or conservative, states have adopted the measure. And the counterterrorist laws were applied to resistance movements because resistance is the heart of the people that has beaten throughout the entire history of our continent. Because in class struggle it is what speeds up history, and we should plant ourselves firmly. Someday it will be necessary to open the systems hand so that he distributes the riches that we the workers produce. And that will not make us terrorists. Justly, what we spread is solidarity. Fear, theft, death are what feed capital. Those of us who fight from below condemn indifference—which is the embodiment selfishness. The new movements, those which brought together the mix of mobilizations from June 2013, and those which resisted a bureaucratic process of cooptation in the prior stage, will face a new obstacle if this bill is passed. Some police actions that are now being practiced, like preventative prisons, will be legitimized by this law. And so it will demobilize popular struggles to defend persecuted figures, instead of overcrowding the class struggles for just vindication. 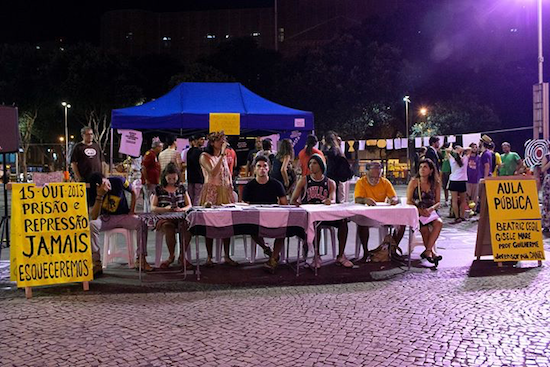 The calls for resistance are open in all of Brazil, and the rest of Latin America is the model of what is required to resist the passing of this law. Diego Ferrari is a social worker, human rights activist and member of the Filhos e netos por Memoria Verdade e Justiça en Rio de Janeiro (Children and Grandchildren for Truth, Memory and Justice in Rio de Janeiro) group. He has participated in social movements such as the Dario Santillán Popular Front in Argentina, and contributed as Political Teaching Coordinator in the ENFF of Brazil´s Landless Workers Movement, Movimiento Sin Tierra.